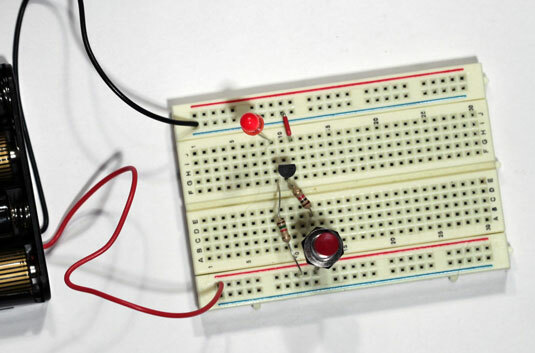 This project shows how to assemble a simple transistor NOT gate on a solderless breadboard. For this electronics project, a normally open pushbutton is used as the input. When the button isn’t pressed, the input is LOW and the output is HIGH, which causes the LED to light. When you press the button, the input goes HIGH, the output goes LOW, and the LED goes out. 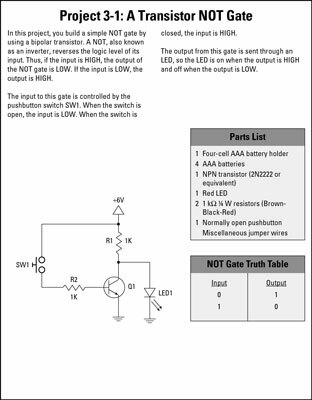 A NOT gate simply inverts its input. If the input is HIGH, the output is LOW, and if the input is LOW, the output is HIGH. 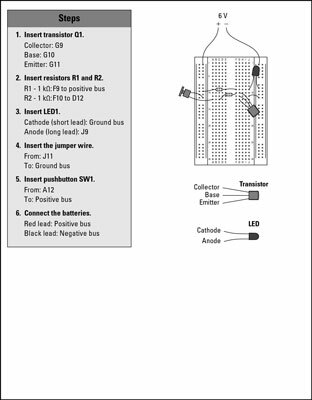 Such a circuit is easy to build, using a single transistor and a pair of resistors. The operation of this circuit is simple. The input is connected through resistor R2 to the transistor’s base. When no voltage is present on the input, the transistor turns off. 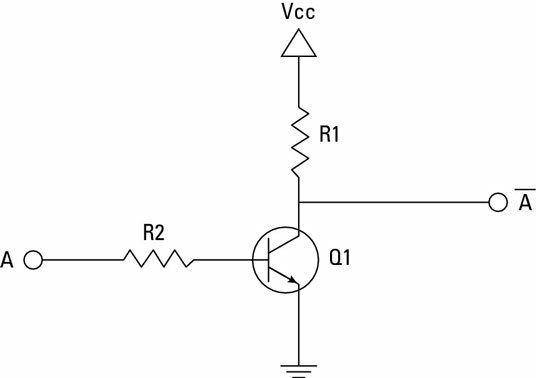 When the transistor is off, no current flows through the collector-emitter path. Thus, current from the supply voltage (Vcc in the schematic) flows through resistor R1 to the output. In this way, the circuit’s output is HIGH when its input is LOW. When voltage is present at the input, the transistor turns on, allowing current to flow through the collector-emitter circuit directly to ground. This ground path creates a shortcut that bypasses the output, which causes the output to go LOW. In this way, the output is HIGH when the input is LOW and LOW when the input is HIGH. A transistor NOT gate assembled on a breadboard.